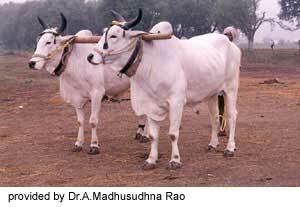 The Ongole breed, like other breeds of cattle in India, takes its name from the geographical area in which it is produced. It is also called the Nellore breed for the reason that formerly Ongole Taluk, a division of a district, was included in the Nellore district, but now it is included in the Guntur district. The area is part of the Andhra Pradesh in India. It is claimed that the finest specimens of the breed are found in the area between the Gundalakama and Alluru rivers in the Ongole and Kandukur taluks, and also in the villages of Karumanchi, Nidamanur, Pondur, Jayavaram, Tungtoor and Karvadi and along the banks of River Musi. They are also famous from the taluks of Vinukonda and Narasraopet. The Ongoles are large-sized animals with loosely knit frames, large dewlaps which are fleshy and hang in folds extending to the navel flap, and slightly pendulous sheaths. They have long bodies and short necks; limbs are long and muscular. The forehead is broad between the eyes and slightly prominent. Eyes are elliptical in shape with black eyelashes and a ring of black skin about 1/4 to 1/2 inch wide around the eyes. Ears are moderately long, measuring on an average for 9 to 12 inches, and slightly drooping. Horns are short and stumpy, growing outwards and backwards, thick at the base and firm without cracks. In some animals the horns are loose; this is probably due to the horn core not growing well. The hump in the males is well-developed and erect and filled up on both sides and not concave. The skin is of medium thickness, mellow and elastic and often shows black mottled markings. The popular color is white. The male has dark gray markings on the head, neck and hump and sometimes black points on the knees and on the pasterns of both the fore and hind legs. A red or red and white animal of typical conformation is occasionally seen. They have a white switch of the tail, white eyelashes, a flesh colored muzzle, light colored hooves, dark gray marking on the hindquarters and dark mottle appearance on the body. 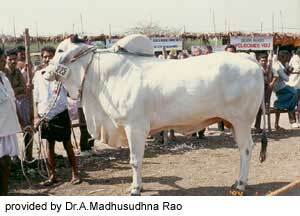 Ongole cattle are efficiently used in their native home for both work and milk production. They are usually docile and the bulls are very powerful, suitable for heavy plowing or car work but are not considered to be suitable for fast work or trotting purposes. The cows are fair milkers. Milk became useful since Rigvedic period. The selected those animals species that are having vigor, inborn nearness, social ability and docility. The evolutionary process has been accelerated in the domestic species particularly cattle, as a consequence of 10,000 years of selection by human, during this period with in the species genetic variation which is essential for the survival of all species, has been partially redistributed in the formation of the large number of unique cattle breeds now exists. These breeds have adopted too many environments as the breeds spread and have been used to produce different types and combinations. A major group of mammals to be domesticated after caprinae were the large ruminants (Bovinae), which included the humped (Bos indicus) and hump less (Bos Taurus) cattle, yak, mithun, banteng and buffalo. This range of species in the family Bovinae make a very large number of important contributions to food and agriculture, providing just under 30% world meat and 87% world milk. This Bovinae provided the planet with a means of digesting via fermentation. Same types of zebu animals are present from the time of Indus Valley civilization dating back to 3000 BC Indian subcontinent is a treasure house of Bos-Indicus Cattle. Farmers in the breed tract has selected and preserved each successive variation, with the distinct intention of improving and altering a breed, in accordance with a preconceived idea, and by thus adding up variations, often so slight as to be imperceptible to the uneducated. He has effected wonderful changes and improvements in the direction he desired as we see here under in Ongole Breed from 1880. There is a tendency in the breed to grow leggy with sparse light carriage, but their form, temper and endurance earned nearness to the breeders. Solar radiation received from sun is through solar terrestrial. The amount of radiation emitted for a particular location depends on global positioning, latitude, and longitude. Infrared radiation is intense in tropics, having sterilizing effect, stimulates tissues, increases metabolic processes. Non-pigmented skin has a definite hazard. 85% of solar radiated heat is sent back to the environment by the Ongole animal through its white, reflective coat. Diurnal variations such as seasons, humidity, latitude, altitude, influences variation in radiant heat loads. The rest 15% of heat immediately absorbed by the under lying black skin. When the animal has nine blacks, total body skin will be black these cattle reduces heat load through behavioral means, and postural adjustments, also orientation towards sun make it protect its own parts through shade and thus reducing heat loads. Long legs of this breed helps in minimizing absorption of solar radiated heat. Light carriage also helps are exposed to sun. Light is the most constant factor having vigor. Light influences on pituitary, shedding of hair on seasons, increase in metabolism, vision. High light intensity decreases cell wall content and increases water-soluble carbohydrates in vegetation and thus influences livestock. % of moisture in air is humidity. Air moisture content influences animals heat balance particularly in warm climates where evaporative cooling is crucial to homeothermy. High humidity associated with high temperature favors less nutritive value of feeds and fodders, of ten the stock are light colored, with pigmented skins, and shade lovers. These influence humidity aerial movement, transpiration, rainfall and temperature. Originally the breed tract comprises areas where there is no assured or commercial crops, leaving cattle raising as the only profitable proposition by selling bull ghee (Clarified butter), since crops and cultivation are not profitable. The farmers are quite aware of the food, investment, manure, forage, draught animal power and employment linkages, improving through subsistence security, transfer of nutrients, modification of vegetation and finally increasing the human support capacity of the land through Ongole breed of cattle. These cattle raising formed a part of risk education strategy with agriculture, as livestock is a saving account and their calves are interest. The farmer is quite conscious of the herd management policy options on direct costs and indirect costs, breeding, off take, purchase and culling. It clearly indicates this breed is originally dairy, later transformed as dual purpose i.e., dairy and draft animals, presently mostly a draught animal. The breed tract comprised between rivers Krishna on Northern side, Pennar River on Southern side, nalamalai range of forest on Western side and Coromandai coast on Eastern side lying between 15.00 to 16.10’ east latitude and 79.04’ to 80.02’ north longitude. The rivulets gundlakamma, madigandi, Paleru, Muneru, Musi, Chilakaleru. Whose extensive banks became excellent grazing areas. With population growth and consequent demand for cereals the Brahmini bull selection system has been oriented towards draft characters. The soils are black loam to black clay having large quantities of lime with soil pH of 6.9 to 7.2 most favorable for notification bacteria and luxuriant growth of legumes. Annual rain fall of about 900mm with about 50 rainy days out of which 2/3 roads are from southwest monsoon and 1/3 from northeast monsoon supporting most of the cereal crops. The average ambient temperature of maximum 32 degrees Celsius and minimum of 23.5 degrees Celsius and average relative humidity of 79%. After formation of Krishna and Godavari Ayacuts during 1850’s with assured irrigation and increased demand for draft services, the breed tract extended to Krishna, Godavari and northern circars. Original tract is for breeding and extended tract for breeding and rearing, further ceded districts and Nalgonda and Mohaboob Nagar districts as rearing tracts. Extension of breed tract forced for 2 reasons. The demand for draft services from the area and generally the same species need the same resources and thus are bound to complete for the same, except when they are colonizing a new habitat, as such expansion of the tract. 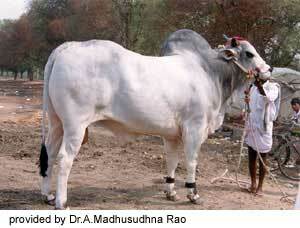 Before organized efforts of the colonial rule, the institution of Brahmini Bull system in the ongole area has substantially improved the breed by avoiding inferior breeding and inbreeding. It has been the custom in the area that dedicating a young bull selected by a village committee funded by village rich men or the local diety and the bull being branded at a ceremony either with Sanku, Chakra, Trisul, then becomes common property and Brahmini bull is the property of the village and covers the village herd, this is how a small farmer provided the stud services. The changes in cropping pattern from cereals to commercial crops like chillis, and Tobacco during the 1930’s and cotton during 1960’s have badly affected the breeds feed resources. 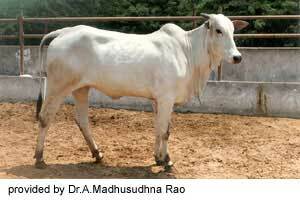 With the introduction and expansion of artificial insemination programs rapidly has resulted in affecting the distribution of breeding bulls under various schemes have been stopped and there is decay in the institution of Brahmini Bull system which primarily supported the breed for centuries. 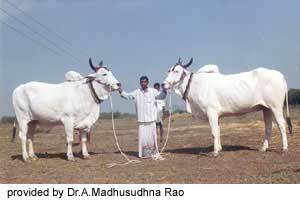 During 1960’s introduction of Taurus breeds through aid programs has helped large scale indiscriminate breeding in the valuable Ongole herds. Like all other resources, the livestock wealth should also to be carefully and properly utilized and preserved. Planners in an attempt to improve milk production in Ongole cattle did many mistakes. One major error was the perception that output reflects efficiency, Hence the use of exotics on Ongoles to improve indigenous stock. Output was very often the main criteria for which a breed was imported. Finally after sinking in a lot of money and time, we could learn that genetics is only one and often not the main tool that can ensure greater efficiency of output. Husbandry, survival, health, reproduction efficiency of feed utilization parameters becomes important. In a craze for cross breeding the excellent government herds built up for decades were also not spared by the planners. The saying that breeding policy should depend on animal, existing production potential, anticipated, goals, environment, man and economic development rather than prejudice, taste and trivial dictates. Reticulo endothelial system well developed. Through their coating, insulating, secretary characters are more resistant to tick born diseases. Zebum secretion is fly repellent. Flexible tail tip, having cartilage in place of last 3 or 4 vertebrae helps as a brush to repel vectors. The effects of climatologically variables on Ongoles are varied. High external heat load due to both radiant and high air temperature exposure depends on degree, and duration. On acute exposure the animal tries to accommodate rather than combat. As a routine the metabolic heat and the catabolic heat produced with in the body also needs to be eliminated. When heat loss mechanism reaches its maximum values the animal resorts to methods of reducing heat production in an effort to achieve homoeothermic. Reduction in calarogenic hormones accompanies decrease in Basal Metabolic rate, voluntary feed intake, muscular and ruminal activity and changes in release of gonadotrophic hormone and thus reduced sexual activity. Ability of animals to maintain core temperature in physiological adaptability and the ability to maintain production/reproduction/growth rates in productive adaptability. These two are often at variance. Thus selection of traits of physiological adaptability is often incompatible with improvement of production and consequently they are undesirable. Mere reproductive opportunism is generally short lived, if the adaptive ness of the organism is not maintained and almost invariably proves self-limiting. This is not the case with the Ongoles. Long range fitness of ongole cattle population depends on adaptation, through the stability, variability and the rate of environmental changes helped through domestication by the farmers as they are treated as family pets. Selection of Ongoles, which attain homeothermy mostly by heat loss mechanism without resorting to reducing the heat production would be those of choice from economic view point. No larger breeds of livestock were ever bred in acid pH soils. The soil pH being 7.2 in tract most favorable for legumes. So it increased muscle protein and skeletal size. Cattle in acid pH soils are small in size and are shade lovers. The fodder crops, grasses and trees that supported the breed for centuries need to be enlightened. The fodder crops either grain or crops or crop residues available from sorghum, zeamays, crotalaria, macrotylma, vigna, cicer, pennisestum, sataria, oryza, kollaganjeru, fodder trees like acacia, azaridachta and fiscus are also used to shade trees. The fodder grasses that were grown naturally on rivers and rivulets banks, private grazing lands and common grazing lands include andropogan, iseilema, indigofera grasses species has maintained this breed for centuries. After formation of ayacut the Ongole cattle need to go to forest for grazing from June/July and return only after December/January, surviving predation and theft later attending to threshing operations of cereals. The migration of population from rural to urban areas, changes in society and pressure on land working against the interest of Ongole cattle, since they are located specific the available poor, scanty, sparse, and seasonal fodders which are low in protein and high in fiber need to be improved by inter-cultivation of legumes, intercropping, chaffing, treatment by way of extensive use of agro industrial bye products should be extensively used. Intelligent and respond well for treatment if handled with love, skill, and care. Athletic in nature, with majestic appearance, head high, square walk and quick step, giving noble but heavy look. Try to move in groups to avoid predators. Highest ability to self-preserve and longevity is more than 15 years. Long bodied with big skeletal size and with ability to gain weight more perceptible after 2 years of age and massive. Lack in heart girth due to preponderance of draught type. Vitality and Vigor unique in young ones. Highest combining ability for cross breeding and formation of new breeds. Highest rustling ability to walk long distances in search of food and water and to pace with the herds. Marked tolerance to direct sunlight and radiation. Loose skin, hump, dewlap and other appendages contribute 12% excess surface area per unit weight over Taurus breeds. Outward disposition of horns helps defend from predators. Have highest coetaneous and lowest respiratory heat loss as such panting is less. Have highest multiple ability of adaptation for climate fodder and pathogens. Sensitiveness, intelligence and shyness make them more independent and less dependent on man, more energetic and resourceful. Reproductive uniqueness, higher reproduction rates and more number of lifetime calves high calf survival rates. Calving ease and minimum dystokias, with more birth weight of cattle. The skin covers body and provides protection literally a thermostat for the body. Heat flows from core organs like brain, heart, liver, spleen, intestines, and lungs to surface of body and from surface it should be sent out to environment through radiation, conduction and convection. Skin contains sebascous and sweat glands, muscles, roots of hair, fallacies and capillaries. When all nine blacks are present, the whole skin is pigmented and black. The presence of subcutaneous “panniculus carnosis” muscle helps in repelling vectors through twitching. When sweating/respiratory heat loss is 6 in zebus where as it is only 4 in Taurus breeds. Water resorption in kidney and colon is double that of the Taurus. Though skin studies were done in 10 indigenous breeds in India no work was done in Ongoles, but the skin type may lie between type 1 and type 3. Skin being highly vascular more heat is sent out as sensible heat loss or diffusion heat loss. In Ongoles evaporative and sweat contribute much heat loss. Ongoles cattle skin secretes zebum, which filters ultraviolet rays. Due to high vascular they bleed profusely if punctured and wounds will heal quickly. Being black in color the 15% of solar heat allowed by coat to pass on is at once absorbed by the skin. Our farmers are so intelligent that umbrellas are black in color but in villages they used to stitch white cloth over the black cloth on the analogy of the structure of Ongole cattle i.e. white external coat and black underlying skin. During evolutionary process the body temperature has been increased, at the same time tolerance for that temperature failed to take place in male gametes. This was circumvented through effective thermoregulation mechanism of tests.